Christmas will be here before we know it and I’m behind on getting holiday crafts made. This Christmas ornament (that also serves as a neat little treat holder) is one of my favorite things to crochet when I was a kid. I remember spending an afternoon crocheting enough Christmas stockings to cover our entire tree. 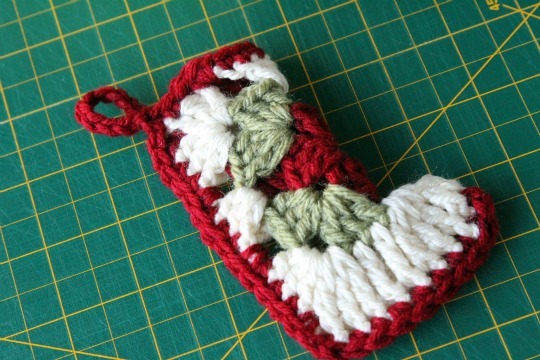 This crocheted stocking (or bootie) ornament is made from muted, almost vintage looking yarns in traditional holiday colors of red, green, and cream. Feel free to change out the colors to fit your Christmas tree’s theme. The stockings can also be stuffed with a candy cane and used to decorate a Christmas gift. 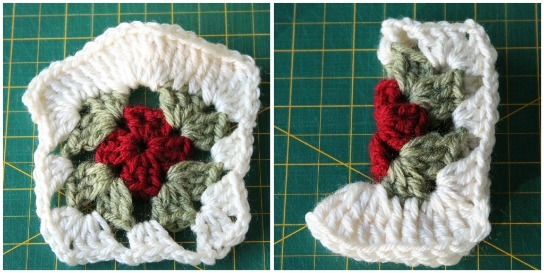 The granny square stocking ornament is composed of a starting loop to which I add three rounds of crochet. In the fourth and final round you’ll create the hanging loop, as well as sewing up the side seam, which also outlines the bootie with an accent color. Yarn: Worsted Weight, 4-Ply in three colors. 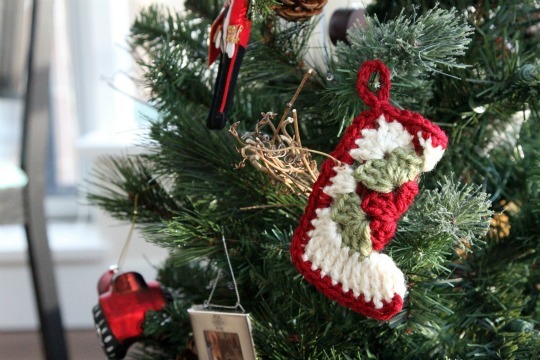 Great use for scrap yarn since very little is needed to make the Christmas stocking. Finished Size: Stocking is approximately 4.5 inches tall. Chain 4, slip stitch into first chain to form a small loop. Chain 3, this will serve as your first double chain (dc), dc two more times in the loop for a total of 3 dc. *Chain 1, 3 dc in loop. Next, chain 1 and slip stitch into top of the original chain 3 stitch that started this round. You’ll see that the chain 1 spaces form the four corners of the granny square. Note: For info on how to change yarn colors, view this video tutorial. Starting in the opposite corner from where you tied off the red yarn. Attach your yarn in the chain 1 space from previous round. Chain 3 (to serve as first dc), then dc two more times in the same chain 1 space. Chain 1. *In next chain 1 space — 3 dc, chain 1, 3 dc, chain 1. In the beginning corner chain 1 space, 3 dc, chain 1, slip stitch into top of the original chain 3 stitch that started this round. Tie off green yarn. Starting in the opposite corner from where you tied off the green yarn. Attach your yarn in the chain 1 space from previous round. Chain 3 (to serve as first dc), then dc two more times in the same chain 1 space. Chain 1. In next chain 1 space — 3 dc, chain 1. In next chain 1 space (corner) — 3 dc, chain 1, 3 dc, chain 1. In next chain 1 space (corner) — 3 dc, chain 1, 3 treble-chains (tc). tc in each of next 3 dc. In next chain 1 space — 10 tc. In next chain 1 space (corner) — 3 tc, chain 1, 3 dc, chain 1. In next chain 1 space (starting corner), 3 dc, chain 1 and slip stitch in top of beginning chain 3. Tie off white yarn. If you fold your granny square in half, you’ll see that it now resembles a boot shape. The final step is to create the loop and sew up the side/bottom seams. 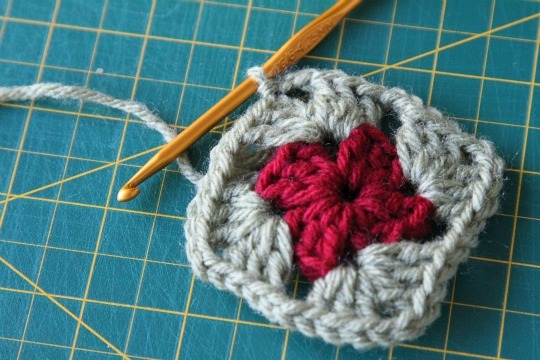 Lay the granny square flat with top side facing you. The treble chains should be at the bottom of the granny square you’re viewing. Attach the red yarn in the upper right corner’s chain 1 space. Single chain (sc) in the top of each dc across this side of the granny square. Place one sc in the chain 1 space. End when you reach the upper left corner of the granny square, placing your final sc in the corner’s chain 1 space. Chain 10. This will form the loop for hanging the ornament. 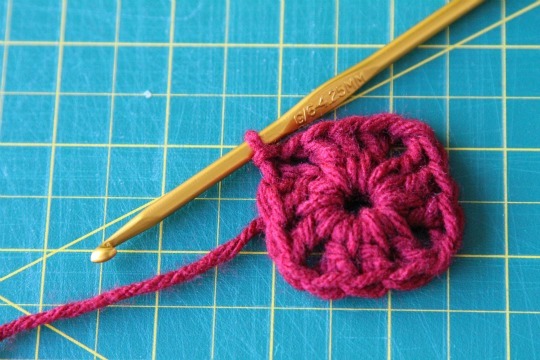 With the granny square folded in half to form the bootie, place hook through the chain 1 space of both side’s of the granny square and slip stitch to attach the loop. Place hook in top of next dc (or tc when you reach the bottom) of both side’s of granny square and sc to sew up the seam. 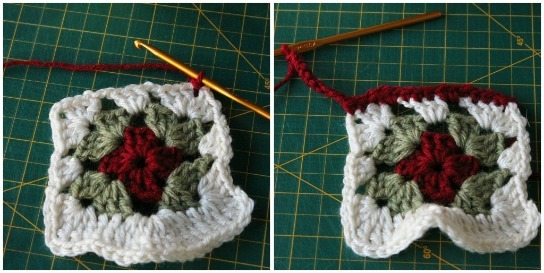 Continue down the side placing one sc in each stitch, always going through both layers of the granny square. When you come to a chain 1 space, place one sc in the space. Continue until you reach the point of the boot, then tie off yarn.